Other than doing research in cooperation with many prestigious national and international institutions and being committed to education and training, CIBRA provides consultancy and specialized services. Based on a large experience in designing its own original equipment and in performing marine mammals surveys and underwater bioacoustic research, CIBRA can provide support to other scientific, industrial and military institutions to setup their own experimental protocols, to design their instrumentation and to assist in the design and implementation of mitigation procedures to evaluate and reduce the impact of underwater noise on marine mammals. For all these activities CIBRA can offer its own expertize, its specialized equipment, experienced personnel, and specialized partnerships with external companies. 24/24h continuous acoustic monitoring and recording with high quality towed arrays. More than 15 years experience in marine mammals' surveys on both small sailing vessels and oceanographic ships. Design, development and installation of acoustic monitoring, navigation and GIS equipment for marine mammals' surveys. Design of custom components and instruments. Design, assembling and installation of towed arrays for both research and the implementation of mitigation policies. 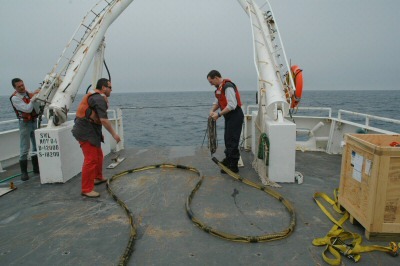 Experienced marine mammals' observers (MMO) for surveys and mitigation. Wide experience in the implementation of mitigation policies in both sonar and seismic operations. 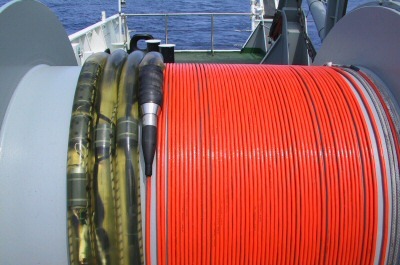 Wide experience in using acoustic and oceanographic equipment. 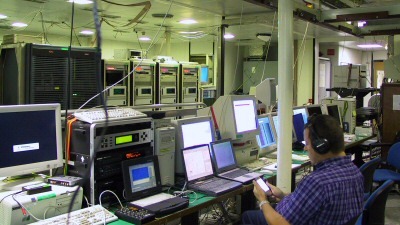 Specialized PAM Workstation developed at CIBRA for continuous recording with real-time monitoring and analysis of multiple sensors (towed arrays, stationary hydrophones, sonobuoys). The PAM Workstation can be integrated with navigation display, GIS display and visual observers' data collection on a dedicated high speed network. GIS map of acoustic contacts with dolphins (red) and sperm whales (black). The ship track is yellow in daylight conditions, grey at night. 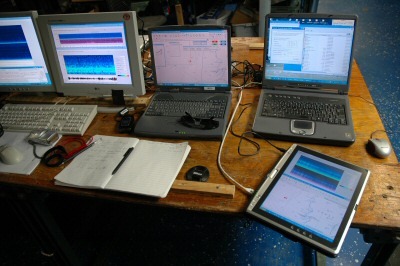 PAM Workstation: logger panel, navigation display and acoustic contacts in a seismic cruise.